The burning bush outside my kitchen door is flaming red in autumn. 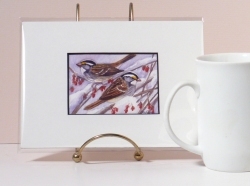 Once it loses its leaves, bright red berries can be seen that must taste delicious to these little sparrows once the cold winter sets in. I'll spot them sitting in the bush eating berries throughout the day. They come back every day until the berries are gone. This year, I've also noticed juncos eating the berries, so it appears they have some competition. 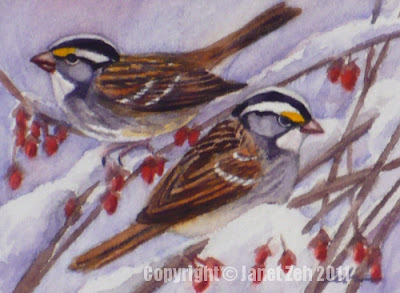 In this painting, two white-throated sparrows sit on snowy branches surrounded by yummy berries. ~Thanks for stopping by. If you have snow where you are, I hope you can enjoy it! Check my Etsy shop: JanetZeh.Etsy.com for more small paintings.